Byron Alfred Whitmarsh was born in Mocane Oklahoma, on April 18, 1923. After graduating from high school he enrolled in Civil Engineering at Oklahoma A & M in September 1942. This is where he got his first taste of the Army. B.A. Whitmarsh – Camp Maxey July 1944. 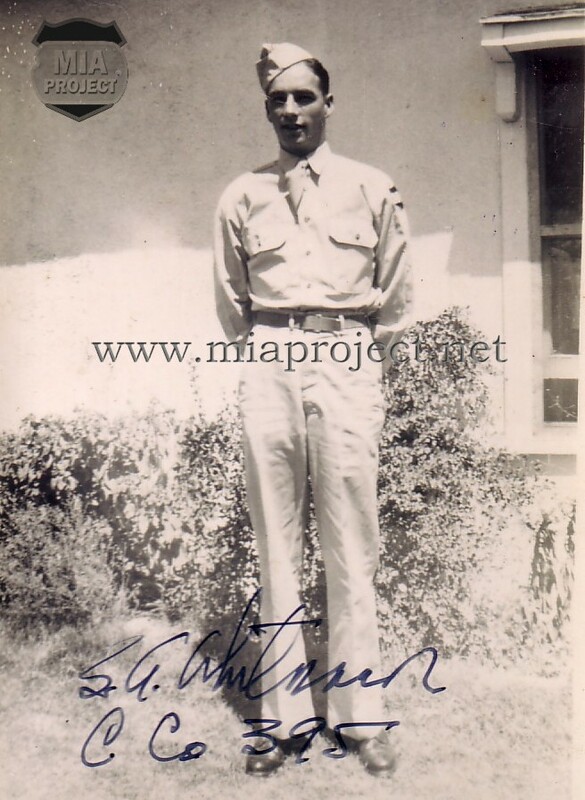 Whit, as he was known in his outfit, went through the hard days of Battle of the Bulge and by March 1945, he was a buck Sergeant and squad leader. The 1st Battalion of the 395th Infantry was approaching the region of Bergheim, Germany, and the resistance was stiff. 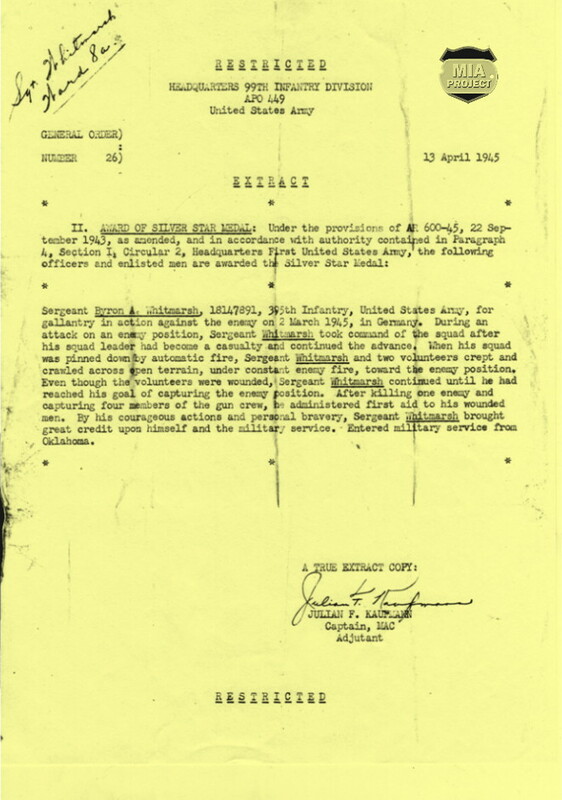 On March 2, 1945, Company C was about to capture the town of Fortuna and Whit about to earn a Silver Star. 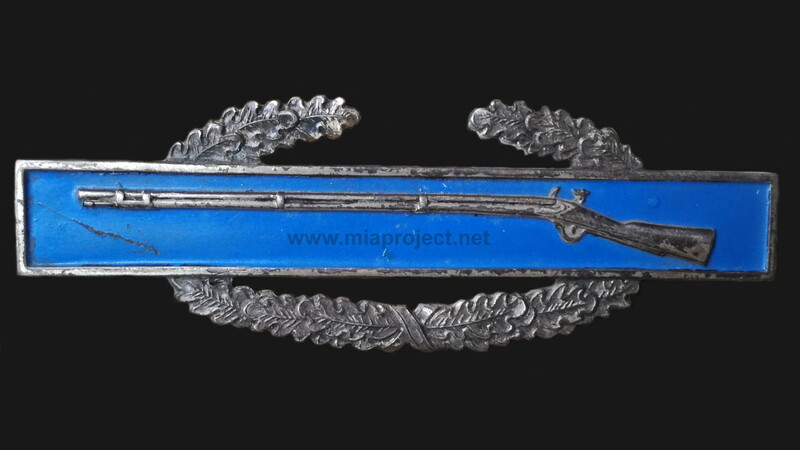 “… I received the Silver Star in the hospital in England in May 1945. The citation is not an accurate description of what really happened. About the only things correct are my name, rank and ASN …” explains Whit with a large smile. Sgt Whitmarsh official Silver Star citation. The leading squad leaders were killed immediately and many others in the platoon were hit in the first blast. Everyone hit the ditches and started returning fire. The small arms fire and shouts were deafening, things turned into a wild chaos. “ … There was a German self-propelled gun to the right of the wall …” continued Witmarsh “… someone got it with a bazooka and the men shot the tankers when they bailed out. The Lieutenant wanted me to take my squad through a shell hole in the brick wall and get in the building … because we were getting heavy fire out of it. A German in a foxhole was between me and the wall. I tried to hit him two or three times when he would bob his head up and down to see what was going on. I decided to try to throw a grenade in his hole twice but missed… While this was going on, Captain Budinsky, the company commander started running down the middle of the road, yelling orders with complete disregard for his safety. He suddently fell forward, he was killed instantly by the flying bullets. He fell not far from me. I asked for another grenade. Someone offered me a white phosphorus grenade and said this would get him even if it didn’t go in the hole. I threw it and it exploded in a much larger radius than I expected and started smoking heavily. When it died down a bit, the Lieutenant said « Go get him now Whit, he can’t see you coming« . I took off but he had gotten away. The way was now clear and I waved to the squad to come on and made it to the wall. When I looked through the hole at the milking stanchions I could see a breath coming up over a curb in front of the stalls so I got another grenade and flipped it over the curb, then we went through the wall. It turned out that had been a pig laying behind the curb, which was now dead. We went into a milkroom but no more Germans. There was a door leading down into a basement. I threw a grenade down the stairs and shut the door. When the blast flung it open, a German came running up the steps with his hands up. He had been knocked goofy from the concussion. I went down the stairs. There was no one left in the small basement but there was an open cellar door leading out to a church and there was a German there. He immediately threw down his rifle and held up his hands. He had a propaganda leaflet which promised safe passage through the American lines and good treatment with a warm dry bed and three hot meals a day. Sounded like a winner. I got the idea that he might cooperate with us and tell us the best way to try to get into the building so I sent someone out to the Lieut. to ask him to send a man who could speak German. His answer was that we weren’t S-2, to send the prisoner out and get the Hell in the building. We found an unlocked window and entered … the Sanctuary to one side of the altar. There was no one in it. To the front, there was a wide corridor between class rooms. We started down the corridor with our rifles ready and came to some stairs leading down. There was some noise coming up the stairs. We pointed our rifles down and waited. A Priest came around carrying a white flag. Behind him were a German Officer and soldiers. He could speak English and said that all the Germans in the building were surrendering. The German soldiers were taken to the vestibule, told to pile up their weapons and sit down with their hands over their heads. The Priest took me down to the big basement. There were wounded soldiers with German medics and a large lunchroom filled with civilians. The Priest was told to tell everyone to stay where they were until the shelling stopped outside. The rest of the platoon, by then only 17 combat ready, came in the building and we began searching to make sure there were no more Germans. Later some tanks came by and we loaded on them and moved on. I never went out and helped the wounded as stated in the citation. 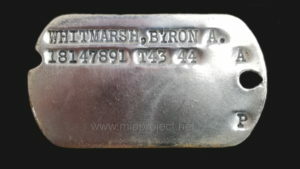 One of the two dog tags Whit carried during the Battle of the Bulge and the day he earned the Silver Star. Sgt Whitmarsh’s Combat Infantryman’s Badge. Whit’s wound was serious. His major problem was the damage to the nerves in his arm. Unless these could be repaired the arm would be useless. Whit was sent to a hospital near Salisbury, England to be operated on May 11, 1945 and sent to the USA on July 5, 1945. It took a long time for damaged nerves to recover. He arrived at Staten Island and went to Halloran General Hospital for a short time before being shipped to McCloskey Gen Hosp at Temple, TX until January 1946. Then to rehab at Brooks Gen Hosp at San Antonio until March 1946 and then to Kennedy Gen Hosp in Memphis, TN where he was eventually discharged. “ … The year in the hospitals doing nothing was the longest year of my life…” concluded Whit. 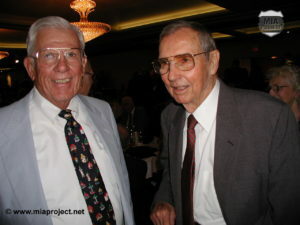 Whit (r) with company mate Vern Swanson at the 99th convention of Little Rock, AK. His arm never healed completely and he kept a little handicap. After his discharge, Whit resumed his studies and graduated from Oklahoma A&M in 1948, with a degree in civil engineering. In October of the same year he married Elsie. After working a few years for the Corps of Engineers, he joined a successful general contracting firm until he retired. Whit created a wonderful family retreat at Lake Texoma, where he enjoyed boating, growing tomatoes, and watching grandkids grow and play. Whit was a member of the 99th Infantry Division Association and attended many conventions. 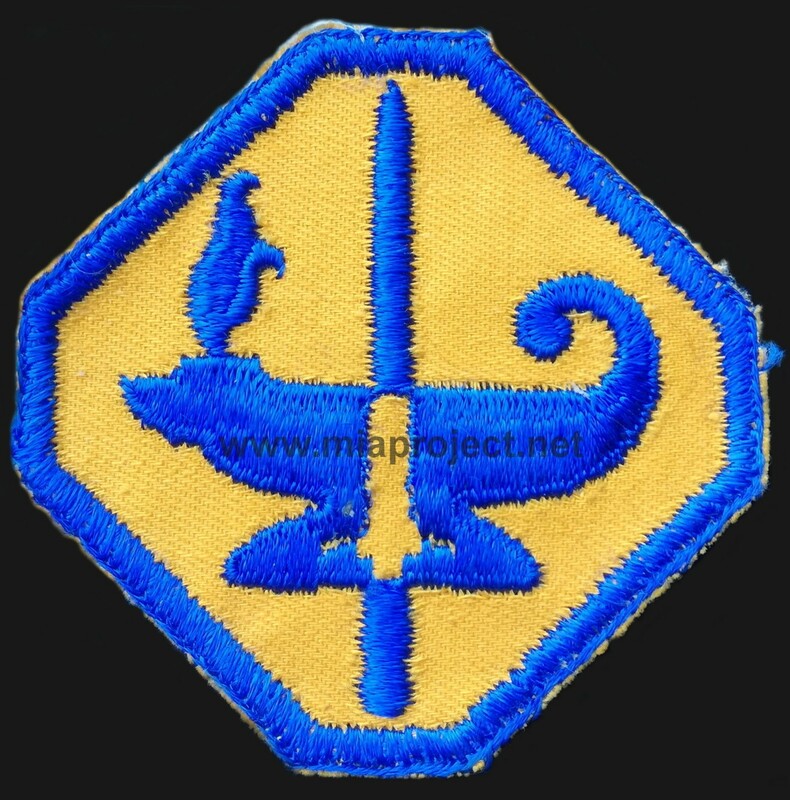 He also made numerous trips back to Belgium and was an active member of the MIA Project. His recollection led to the recovery of missing soldiers of his company. He passed away on February 12, 2008 at his home in Richardson Texas and was buried at the DFW National Cemetery. He always said that he got a Silver Star for killing a pig. 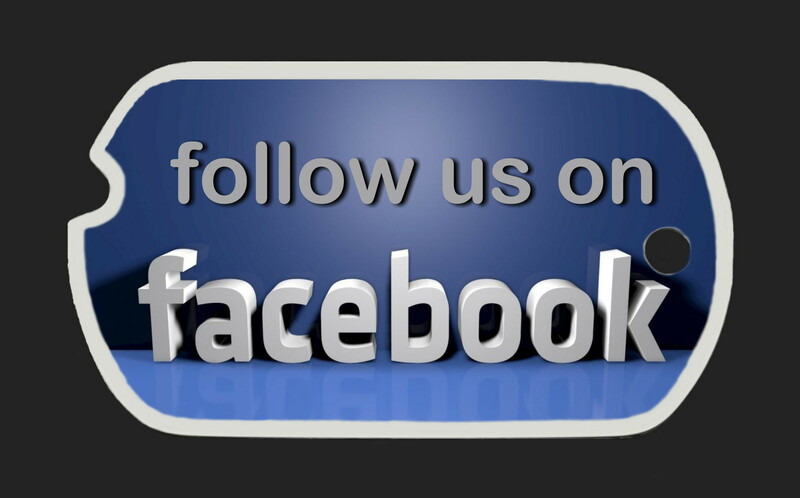 Souces: Interviews and letters of Byron Whitemarsh. 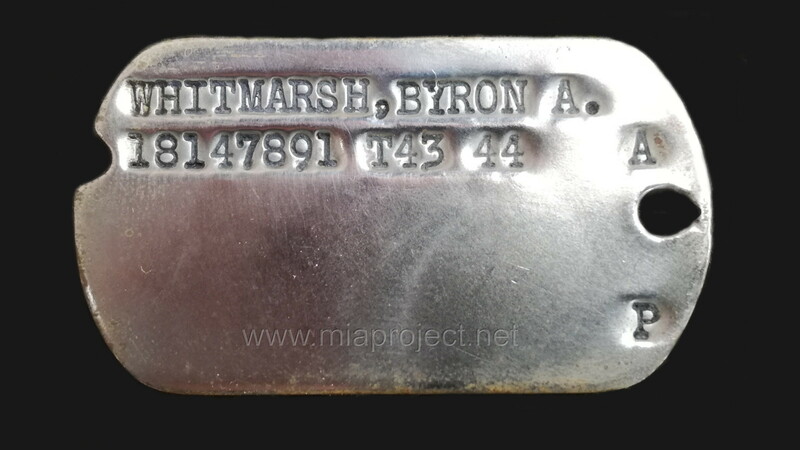 Items shown on this page were offered by Byron Whitmarsh to the MIA Project Collection.